Sunday 3rd of July 2016 saw the season finale of the all-electric racing series, FIA Formula E, at Battersea Park in London. The championship went down to a nail-biting finish with Swiss driver, Sebastien Buemi (from the Renault eDams team), secured the Championship over title rival Lucas di Grassi in a daring showdown determined by setting the fastest lap time in a very chaotic race. Also celebrating over the weekend was Maison Mumm, the official Champagne partner of the FIA Formula E Championship, as they unveiled the “Mumm Grand Cordon” – a revolutionary new champagne bottle with a reinterpretation of the famous Cordon Rouge red sash. 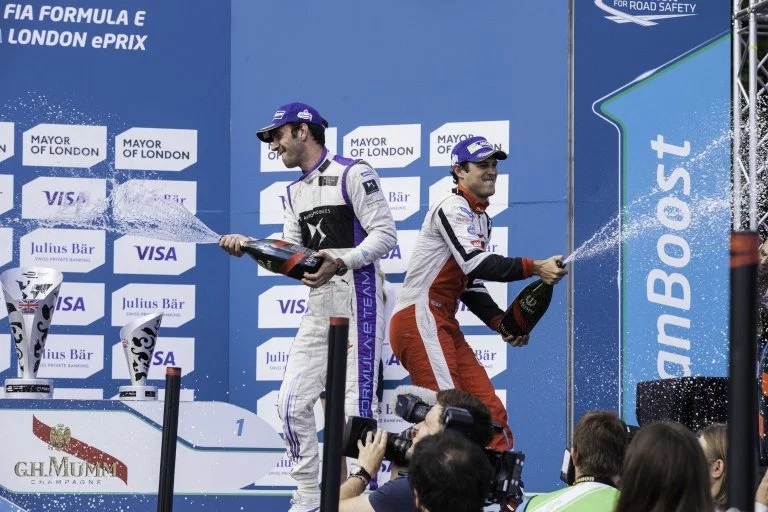 Gurdjian also underlined the role Mumm plays in victory celebrations such as Formula E’s which has drivers flanked by fans on their approach to the podium, champagne spraying and confetti cannons – staying true to the Mumm motto “Dare. Win. Celebrate”.